Nhia Vang is a senior at The University of Wisconsin – Madison as a personal finance major in the School of Human Ecology. Nhia is mentored by Rotarians Bill Coleman and Leslie Hauser. Throughout his college career Nhia has been active on campus. He is a member of the Multicultural Business Student Association and the Hmong Student Association. He also previously served as an Academic Support Services intern and a Hmong Translator for UW-Madison’s Cultural and Linguistic Services. Nhia’s biggest challenge in his sophomore year was finding a summer internship in Milwaukee. Luckily, thanks to his mentor Leslie Hauser, Nhia learned about the Wisconsin Women’s Business Initiative Corporation (WWBIC). Nhia went for an interview and was offered a personal finance internship. This internship experience allowed him to review small business applications and business plans with WWBIC’s loan officers. He also created personal finance educational materials and participated in personal finance education classes. The power of Rotary’s connections allowed Nhia to learn more about what he can do with his major after graduation. 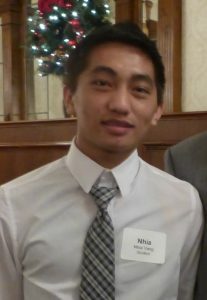 Overall, Nhia is very grateful for the financial and emotional support from his mentors and the Rotary Club of Milwaukee.